Now, I know these don’t look pretty but Oh My, they are absolutely gorgeous! I can’t tell you just how tasty they are – you’ve just got to make them and see. They’ll never be neat enough or easy to eat to be served at a posh dinner party or as canapés, but sometimes you just need some really good food that will make your tastebuds tingle … and this could be the recipe. I was sent a bottle of Lea & Perrins Worcestershire Sauce to use as I wished in any recipe. The good people at Lea & Perrins are trying to encourage us to use a sprinkle in some of our traditional recipes. That was no problem – we use it in all the regulars … lasagne, cottage pie, sausage casserole (in fact most casseroles), chillies, Spag bol. I wanted to introduce a dish that really brings out the flavour of the sauce and that is slightly out of the ordinary. I posted a picture of my Lea & Perrins on Facebook last night and asked people what they use it for. Some of the responses were rather interesting. There was one suggestions for cheesecake but I’m not convinced – it was rather near April Fools Day! 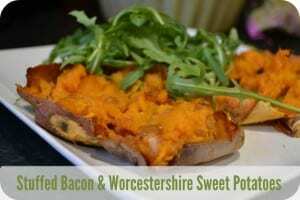 The sweetness of the potatoes go so well with the sharpness of the worcestershire sauce. You get the smokiness of the bacon. They are just delicious! In a frying pan, heat the oil and soften the onions. Add the bacon and fry until cooked through. Add the thyme and the worcestershire sauce. Cut the potatoes in half and scoop out the soft middles. Place all the ingredients in a bowl and mix together. You may need to mash it slightly but the potatoes should be really soft. Serve immediately - We love ours with rocket. Disclosure: I was sent some Lea & Perrins Worcestershire Sauce to use in any recipes that I saw fit. I was given complete freedom what I did with it. Thank you! Filed Under: Recipes, Savoury Dishes Tagged With: food blogging, Recipe development, uses for sauces, what can Lea & Perrins worcestershire sauce be used for, what dishes can worcestershire sauce be used in?